At the moment, there are over 710 cryptocurrencies available for trade. Bitcoin and Ethereum are the two most popular names. Bitcoin is a cryptocurrency and a payment system introduced on 31 Oct 2008, the system is peer-to-peer and transactions take place between users without a intermediary. Since there is no central repository or single administrator, it is categorized as decentralized virtual currency. Bitcoins are created as a reward in a competition in which users offer their computing power to verify and record bitcoin transactions into the blockchain. This activity is referred to as mining and successful miners are rewarded with transaction fees and newly created bitcoins. When sending bitcoins, users can pay an optional transaction fee to the miners. In terms of volume, there are 12.5 bitcoins per block (approximately every 10 minutes) until mid 2020, and then afterwards 6.25 bitcoins per block for 4 years until next halving. 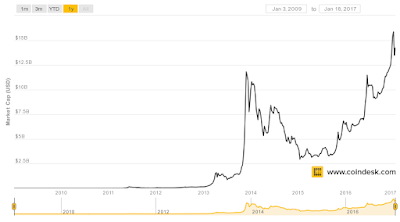 This halving continues until 2110–40, when 21 million bitcoins will have been issued. Another important name in the cryptocurrency is Ethereum, it is an open-source, public, blockchain-based distributed computing platform featuring smart contracts functionality. It provides a decentralized virtual machine, called Ethereum Virtual Machine (EVM) which can execute Turing-complete scripts using an international network of public nodes and a token called ether. In Ethereum the block time is set to twelve seconds compared to Bitcoins 10 minutes. This allows for faster transaction times. Ethereum does this by using the Ghost protocol. Ethereum has a slightly different economic model than Bitcoin – Bitcoin block rewards halve every 4 years whilst Ethereum releases the same amount of Ether each year ad infinitum. Ethereum has a different method for costing transactions depending on their computational complexity, bandwidth use and storage needs. Bitcoin transactions compete equally with each other. This is called Gas in Ethereum and is limited per block whilst in Bitcoin it is limited by the block size. Ethereum has its own Turing complete internal code... a Turing complete code means that given enough computing power and enough time... anything can be calculated. With Bitcoin there is not this form of flexibility. Ethereum was crowd funded whilst Bitcoin was released and early miners own most of the coins that will ever be mined. With Ethereum 50% of the coins will be owned by miners in year five. Ethereum discourages centralised pool mining through its Ghost protocol rewarding stale blocks. There is no advantage to being in a pool in terms of block propagation. Ethereum uses a memory hard hashing algorithm called Ethash that mitigates against the use of ASICS, and encourages decentralised mining by individuals using their GPU’s. Since the publication of Satoshi’s white paper, cryptocurrencies have proliferated the market. No matter how many varieties there are, the key concept is the block chain protocol and the distributed computing architecture used to achieve its value. Block-chain protocols enable Smart contract programs which encode certain conditions and outcomes and verify in real time, acting as a secure escrow service at near zero marginal cost. And with today’s connected technology which allows more transparency on product and service delivery, the use cases for smart contracts is limitless. Of the 710 types of cryptocurrency, only 26 of them had market capitalization over US$ 10 million on 3 Jan 2017. The market leaders are Bitcoin and Ethereum with the former having a market cap of US$14.65 trillion and latter US$903.99 billion. 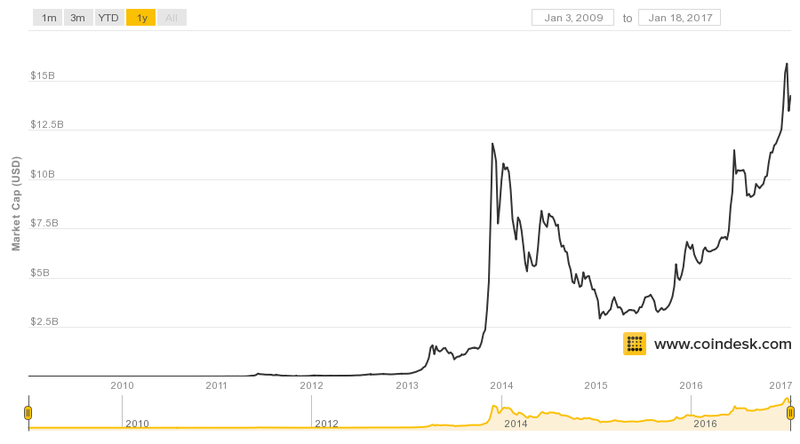 Since its launch in 2008 until now, the total value of Bitcoin grow from 0 to 14 trillion. After its 2014 market crash, its value recovered and reach onto ever high in 2016. Access to Everyone: Anybody who has internet access can use cryptocurrency. According to Mark T. Williams, as of 2014, bitcoin has volatility seven times greater than gold, eight times greater than the S&P 500, and eighteen times greater than the U.S. dollar. These numbers reminded me of an old concept: the dual nature of a currency, one as a product and one as a currency. As a product it is sold and bought on the market as the price change based on people’s sentiment; while as a currency it is used to price products and services on the market. Which bought me to think about another question: how would a system like this works because it would mean that the price of a product or a service fluctuates all the time as every consumer goes through the door. As a business owner, s/he has little control over the price fluctuation (even less on cryptocurrency market as there are few if any hedging product available). Nevertheless, to fully leverage on the benefit of cryptocurrency, it has to function more like a currency. All its benefit is based on the assumption as it is used, not that it is bought and sold. At the end of the day, a currency is used to exchange values, and bitcoin or any other cryptocurrency trump in this sense as a safer and cheaper means to achieve the function. And with more adoption across the supply chain on cryptocurrency, its future as a new form of currency looks promising. While there is a more ideal aspect of cryptocurrency, which is about distributed trust and freedom. The money of the current days has no intrinsic value, as the value is based on two or more people commonly agree, money is intrinsically a social concept. Nevertheless, the social nature also means that we need to ensure our ability to exchange which means everyone start stockpiling something they figure everyone else want. Over the years, we have build up a social hierarchy that allow people to accumulate wealth and we also agreed, over the centuries, that a unit of money represents a portion of inclusion within the system, when a person accumulates a great deal of money, they also have a greater degree of inclusion or representation. This very concept is based on a form of social trust, or in other words, a fair measurement. And more use cases can be applied to this field, real state contract, business contract, identification certificate etc, the point is, money, financial systems, government records, contracts and more, all of them, are social constructs and an arbitrary and inefficient way of doing things. So the question of if bitcoin or any type of cryptocurrency will exist, thrive or die, really is the question of what is fair. How can we actually measure it, and how then can we translate this in technology term. Say, if we would be able to measure how much it is needed to achieve common individual goals (e.g. not to be hungry; have education), to punish certain behavior that we want to discourage (murder; corruption etc) and to ensure these goals and punishment, how much reward should be received (e.g cook a meal; sell a pair of stockings to a lady). I mean ,we are able to manifest fairness in cryptocurrency. Then that form of the cryptocurrency, be it bitcoin, Ethereum or whatever it is, will then be able to prevail the world for its true and most simple reasons, efficiency. This conclusion brought me to question something I have touched upon several times since I started blogging. What is a meaningful contribution? Or what is the meaning of life? Is there something better we can be doing than what we are already doing and why are we not doing that? Why are society tolerate inefficiency? Cryptocurrency at the end of the day is a tool, it is up to us to utilize it to achieve our objectives which can be different from person to person ,from time to time. The future of cryptocurrency of a new way of contracting is bright, while it is value of a product for investment is uncertain.